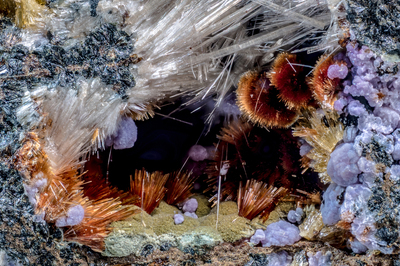 In a small vug opened between dark brown ray crystals (visible in the second child photo) of a mineral from the rockbridgeite - frondelite series: at the top on the left and in the center, radiating crystals of "ivory" color of strunzite; then, all around, sprays and rosettes of brownish-red crystals, orange in the outermost part, of eleonorite; again, especially on the right, but also to the left, tabular crystals rosettes, elongated, terminating in a tip (enlarging photos, they are recognizable), light purple, of strengite. On the right, as crown of a rosette of strengite, elongated, yellow crystals of stewardite. Collection and photo by Gianfranco Ciccolini. Nikon D750, bellows, Luminar 25 mm.